The Cultural Dish: Mascarpone Cheesecake with a Nutella Glaze for World Nutella Day! Mascarpone Cheesecake with a Nutella Glaze for World Nutella Day! 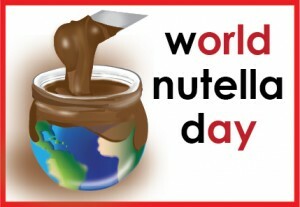 Today marks the 5th annual World Nutella Day! Thanks to two bloggers, Sara from Ms. Adventures in Italy and Michelle from Bleeding Espresso, world nutella day was born, and has been growing ever since! When I first learned of world nutella day, I was in heaven. I remember the first time I had nutella - I was in 12 years old, sitting in my 7th grade French class, and my teacher brought some in for us to try. Since that day, I have been addicted! For nutella day, since I make Crêpes with nutella pretty much every weekend, I decided to try something different - cheesecake! I love cheesecake and I love nutella, so why not combine the two? I adapted this from the Food Network and made a few of my own changes. This cheesecake is a little more time consuming, but is flexible in that you can alter some of the ingredients to your liking and can substitute other cheeses (such as ricotta) if you do not like mascarpone. (Helpful hint: If you do not like almonds, then just use more graham cracker crumbs (about 1/2 of the bag) and you do not have to add the sugar if you do not want to. A more traditional crust would just involve combining graham cracker crumbs with melted butter). (Helpful hint: Make sure all ingredients are at room temperature and depending on your sweet tooth, you can add more or slightly less sugar - I sometimes add even more). Prepare a 9 inch round by 2 3/4 inch high springform pan by wrapping the outside of the pan in at least 3 layers of tin foil. Make sure it is wrapped well because you will be baking the cheesecake in a water bath, and this helps to prevent water from seeping into your cheesecake. In a food processor or blender, grind the cup of almonds. Combine the ground almonds, graham cracker crumbs, sugar, and butter in a bowl, until moist crumbs form. Pour the crumbs into the pan and pat down until the bottom of the pan is completely covered. Bake the crust in the oven for about 10-12 minutes in order to allow the crust to set. While the crust is in the oven, prepare the filling. Blend the cream cheese, mascarpone cheese, and sugar together in a bowl. Add the lemon juice and vanilla. Beat in 1 egg at a time, making sure each egg is mixed in well before adding the next one. Reduce the oven to 325 degrees F. Take the crust out of the oven, and pour the filling over the crust. Make sure it is spread out evenly. Place the pan into a larger pan and fill with water until the water comes about halfway up the side of the cheesecake pan. Bake in the oven for about 1 hour or until just the center of the cheesecake jiggles slightly when shaken. Let cool on a rack for one hour. Place in the fridge and chill for an hour or up to two days. The longer it sits the better it will taste! The flavors need time to meld together. When ready to serve, prepare the topping. Scoop the nutella into a bowl with the heavy (or whipping) cream. Place in the microwave and until warm, stirring every 15-20 seconds to blend. Drizzle the sauce over the top of each slice of cheesecake. If you do not want the sauce, you can also just scoop out a dollop of nutella to place on top! Enjoy! For more nutella recipes, check out Sara's Flourless Chocolate Nutella Cake and Michelle's Nutella Spice Cake - they look delicious! Happy Nutella Day! What a lovely way to celebrate yummy spread and share a delicious recipe eith all of us! Thank you! I am so thrilled with this recipe. I saved it in my favorite recipe list. Thank you so much for sharing!!!!!!!!!! No problem. I hope you enjoy it as much as we did! Looks fabulous! Thanks for the excellent instructions and pictures! I am going to have to try this! !